While you might be more familiar with other health-related ratios -- like weight-to-height ratios or waist-to-hip ratios -- the foot-to-height ratio can be helpful in some situations. It's most applicable in forensic science, when it can -- somewhat morbidly -- be used to estimate height from a foot if the rest of the body isn't available. But foot size can also be used in children to predict the growth spurts that occur during puberty. Your feet serve as the base of support for your body, and they're essential for good balance. The muscles, tendons and ligaments in your feet help balance your entire body. Without them, you'd fall over anytime you lean to the side. And your toes help you keep your balance as you move forward -- for example, when you're walking or running. The taller you are, the more you need a larger base of support. That's why taller people tend to have longer feet and wear a bigger shoe size. The normal height-to-foot ratio is about 6.6:1, according to data from the University of Rhode Island Department of Electrical, Computer and Biomedical Engineering. That means you'll generally have roughly 6.6 inches of height for 1 inch of foot length. However, the ratio is just an estimation, and many people have larger or smaller feet than you'd calculate based on this ratio. While it's easy to calculate a basic height-to-foot ratio if you already know your height and foot size, it's more complicated to use the ratio to figure out an unknown height. But being able to figure out height is important for forensic science -- if the police only know someone's shoe or foot size, it's helpful to be able to estimate his height. And the equation to more accurately figure out height-to-foot ratio was published in Forensic Science International in 2005. The researchers calculated the ratio by looking at the foot size and height of more than 550 study subjects, then looking for mathematical patterns to figure out an equation to calculate the ratio. Unless you're a forensic scientist, you probably don't need to know how to use a complicated height-to-foot equation to figure out height. 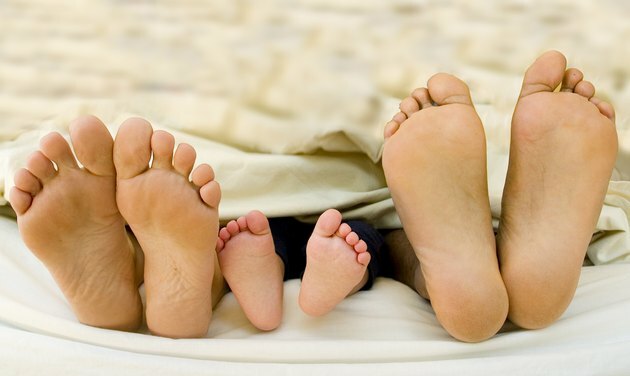 But looking at relative foot size in growing children size can give you some insight into their future growth patterns, since growth spurts tend to start in the extremities before a child sees overall growth. One study, published in Scoliosis in 2001, found that girls experienced fast growth in their feet a little over a year before hitting their growth spurt during puberty, and boys experience foot growth 2 1/2 years before their major growth spurt. The takeaway? If your children are quickly outgrowing their shoes, that's a major sign that they're headed for a growth spurt in the next one to three years. While it can be tempting to measure every dimension of your body to figure out if you're "normal," don't stress out about the height-to-foot ratio. The ratio has only limited applicability in the real world, and it doesn't offer any insight into your health -- if your feet and body are healthy, it doesn't matter what shoe size you wear. Focus on staying active to keep the tissues in your feet strong, maintaining a healthy body weight and following a balanced diet for good foot health. Wear shoes that fit -- not too tight or too loose -- and offer proper arch support, and avoid wearing high heels for long periods of time, since they're linked to foot problems. If you're concerned that your feet are too small or big, or you've noticed any abnormal symptoms in your feet, consult your doctor.